I’ve been wanting to share this recipe for such a long time. 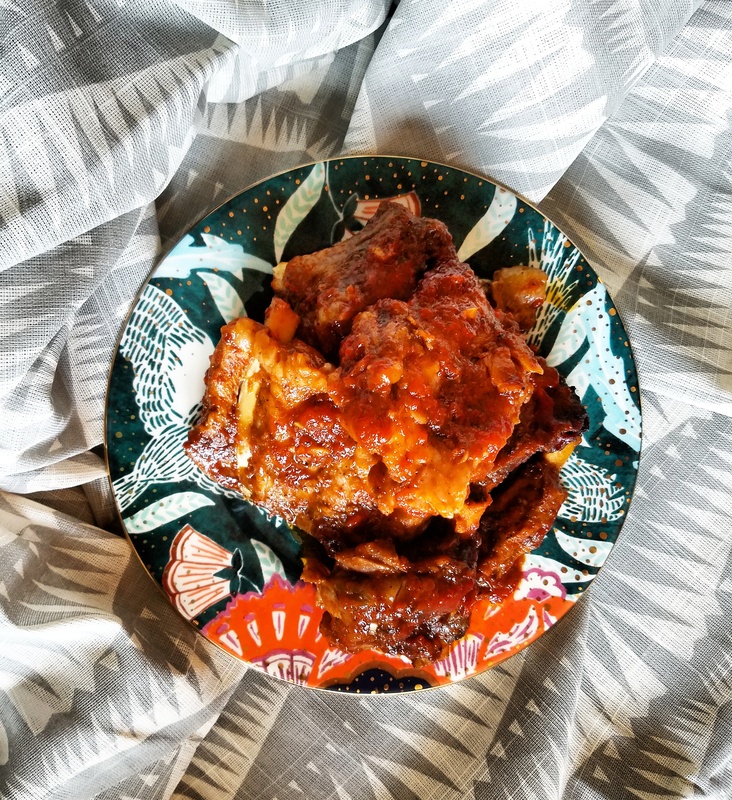 Amazon Prime put three racks of ribs into my hands last week, and I knew it was time to share my recipe for Slow Cooker Portuguese Ribs. First, for those who are Amazon Prime subscribers and live in or near a major city, sign up for the Amazon Treasure Truck texts [signup is located at the top of the linked page]. The morning the Treasure Truck is in town, they will send you a text with their current deal. If you want the deal, just click on the special link in the text, select the time and location that works for you based on where the truck will be, checkout, then meet up with the truck. Before Halloween, their special deal was a 160 piece bag of candy and a pumpkin of your choosing for $8. The candy alone usually goes for $18, the pumpkin for $13. Talk about an excellent deal! Last Friday, I got three racks of ribs for $15.50. That is a great price considering they usually go for $8+ per package. So with three racks of ribs, I decided to finally share this recipe. I took one picture of the ribs before Surita (Matthew’s 19 year old sister) destroyed the set. Matthew came running in after it happened. He’s usually a great set assistant, not so much on recipe days. Surita devoured the ribs. As skinny as she is, I have no idea where she puts it. Luckily, I did get to try it before she ate them. So mouth watering good! I found this recipe for Portuguese Dry Rub Pork Spare Ribs and Spicy Sweet Piri Piri BBQ Sauce a few years ago from Tia Maria’s blog. In the original recipe, Tia Maria bakes the ribs. So if you want to go the old school method, or throw them on the grill, follow her recipe. If you want to go the slow cooker route, follow the recipe below. Unlike most slow cooker recipes, this isn’t a dump into the crock pot, wait a few hours and then it’s done. This is a process (but very simple). What you’ll wind up with in the end is the juiciest, mouth watering, meat falling off the bone, best pork spare ribs you’ve ever tasted. This recipe is adapted for the slow cooker from Tia Maria’s original recipe. Only the BBQ sauce stays true to her recipe. Please note that if you want to bake or grill, please follow Tia Maria’s recipe in the link. [Prep ribs]. Place ribs in crock pot. Pour wine over the ribs and rub the chopped garlic over the ribs. Place cover over the crock pot and let the ribs marinate in the refrigerator for 1 hour. [Mix the seasonings]. Meanwhile, in a small bowl mix the salt, paprika, garlic powder, cumin, black pepper and Piri Piri (or Tabasco sauce), until you have a paste. Set aside. After the ribs have marinated for an hour, take the ribs out of the refrigerator, and rub the spices into the spare ribs using your fingers. Cook ribs on the High setting. [Prepare the BBQ Sauce]. Mix together the ketchup, brown sugar, sugar, worcestershire sauce, piri piri and white vinegar. Put aside. At the 1 hour and 15 minute mark, add the BBQ sauce to the ribs. Cook for another 1 hour and 45 minutes to 2 hours (or until the meat is falling off of the bone).